Parasitic herb 20 cm tall Stem: 1 - 3 cm long, mostly or completely underground. Leaves: few, overlapping, scale-like, oblong to egg-shaped with a blunt or sharp pointed tip, hairless. Flowers: borne solitary at the end of an erect stalk (the above ground part of the plant), the one to three cream-colored stalks are 6 - 20 cm long and covered with glandular hairs. The sepals are fused into a tube with lance to awl-shaped lobes that are longer than the tube, and the white, cream, lilac, or violet petals are 2 cm long, tubular, and two-lipped. Fruit: an egg-shaped capsule, 6 - 12 cm long, 5 - 8 mm wide, usually with wilted petals remaining. Similar species: Conopholis americana and Epifagus virginiana are easy to distinguish because they each have many flowers per plant. Orobanche fasciculata differs by having hairy scale leaves, two to ten purple flowers per plant, and triangular calyx lobes that are shorter than or equal to the calyx tube. Habitat and ecology: This species is sporadic in woods, usually parasitic on oak trees. It has also been found in other locations in the Chicago Region including thickets, prairies, river bluffs, and a shaded yard. 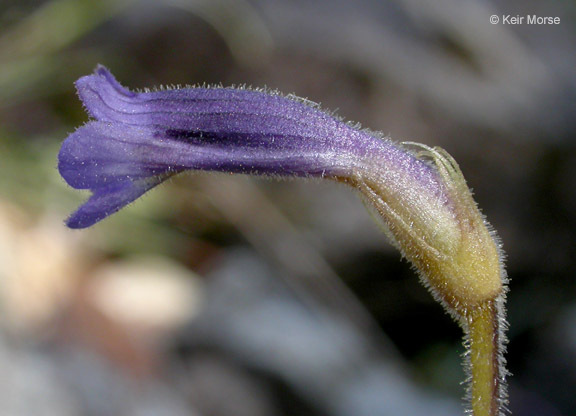 Etymology: Orobanche was the Greek name for a parasitic plant that grew on vetch. The word comes from the Greek words, orobos, the name for a vetch, and anchone, meaning "to choke or strangle," referring to the plant's parasitic habit. Uniflora means single-flowered. This is a rare plant but probably found throughout the state. It has been reported from ten widely separated counties. The plants I have found were parasitic on white and chestnut oak. Bechtel found it parasitic on the roots of a Solidago in Montgomery County. With larger (2-2.5 cm) fls and 5-lobed cal, parasitic chiefly on Achillea, has been reported from Ont.